Few days back i received an email from the Arab Writers Group Syndicate calling attention to the discrimination and violation of human rights by the Egyptian officials against the native Egyptian Christian community, also known as the Copts. Its totally unacceptable and also against the ethics of Islam. It must be noted that this problem is from corrupted political system, degradation of moral ethics and human value which we find so often in our troubled time.
. Egyptian Christians: Strangers in their Native Land! 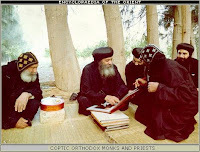 The Copts, Egypt’s indigenous, pre-Arab, pre-Islamic Christians, are a native ethno-religious group of Egypt. Egyptian Christians trace their ancestry to the indigenous Pharaonic-era population of Egypt, converted to Christianity by St. Mark, one of Christ’s earliest disciples. Today Copts number approximately seven to twelve million people and constitute between 10% and 15% of the Egyptian population, making them the largest indigenous Christian community in both Africa and the Middle East. The issue of the Christians of Egypt has gained international media coverage in the last decades. Reports of persecution and discrimination against them in their native country of Egypt have made headlines around the world. [>] Credit and read the whole article here. (more examples and here). Any conscious human being and specially any Muslim will condemn such behavior against other religious minority. Minority religious groups in Muslim majority society is considered sacred responsibility (God's covenant) to protect their rights as that is the teaching of Prophet Muhammad. It's time to remind about the letter of the Prophet which was written specifically for the protection to the monks of St. Catherine and which stands as a hallmark of Islam's attitude of allowing religious freedom which unfortunately we have seen been abused and violated against the very teaching of Islam. St. Catherine Monastery is the iconic site representing Egypt's rich Christian heritage. It is one of the oldest Christian monasteries in the world, St. Catherine's incorporates the burning bush seen by Moses and contains many valuable icons, ancient religious texts. Above the monastery is Mount Sinai (or Jebel Musa, Mount Moses), where Moses received the Ten Commandments from God. This area is thus sacred to three world religions: Christianity, Islam and Judaism. The monastery is Greek Orthodox and currently a UNESCO World Heritage Site, was founded in the 6th century by the Byzantine Emperor Justinian (527-565AD). The Monastery is connected with the history of Islam's broad minded approach and relation with Christian world. According to tradition, during the time of the Prophet Muhammad and due to growing influence of Islam in the region led the monks to send a delegation to Medina in 625 / 628 AD in order to secure protection. The Prophet agreed and signed a document of protection, a copy of which still resides in the monastery and bears the outline of his handprint. It was this document that allowed the monastery's monks to travel freely throughout Muslim lands from the time of the Muslim conquests onwards, without fear of harassment. Below is the English translation of the extra-ordinary letter by Prophet Muhammad as a Charter of Privileges to Christians monks of St. Catherine Monastery at Mt. Sinai. It consisted of several clauses covering all aspects of human rights including such topics as the protection of Christians, freedom of worship and movement, freedom to appoint their own judges and to own and maintain their property, exemption from military service, and the right to protection in war. It bears the hallmark of Islam and Prophet's attitude about the right of other religious practitioners. * This is a message from Muhammad ibn Abdullah, as a covenant to those who adopt Christianity, near and far, we are with them. * Verily I, the servants, the helpers, and my followers defend them, because Christians are my citizens; and by Allah! I hold out against anything that displeases them. * No compulsion is to be on them. * Neither are their judges to be removed from their jobs nor their monks from their monasteries. * No one is to destroy a house of their religion, to damage it, or to carry anything from it to the Muslims' houses. * Should anyone take any of these, he would spoil God's covenant and disobey His Prophet. Verily, they are my allies and have my secure charter against all that they hate. * No one is to force them to travel or to oblige them to fight. * The Muslims are to fight for them. * If a female Christian is married to a Muslim, it is not to take place without her approval. She is not to be prevented from visiting her church to pray. * Their churches are to be respected. They are neither to be prevented from repairing them nor the sacredness of their covenants. * No one of the nation (Ummah, the Muslims) is to disobey the covenant till the Last Day (end of the world). The letter stands out as a beacon of extra ordinary pluralism and how deep the attitude of respect for another religious group can be extended. The letter is a very good reminder even in today's context when sadly we have forgotten inter religious tolerance and mutual respect. Also can be cited the letter of Prophet to Assyrian Christians. May we all join in the call to stop discrimination and violation of human rights against the Christian brother and sisters in Egypt and those actions should be condemned and stopped immediately.
. 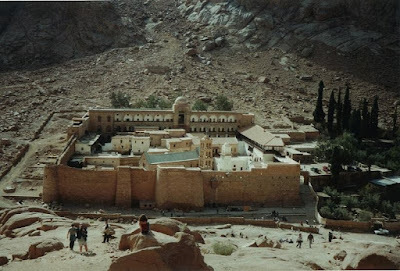 The importance of the written word / St Catherine's Monastery in Sinai is famed for its unique collection of manuscripts.
. A lily in the wilderness / St Catherine's monastery in the Sinai, one of the most important centres of Orthodox monasticism.